Monet has always been fascinated by the play of light and reflections of clouds on water. His numerous paintings done on his floating studio, in Argenteuil or on the Dutch canals, show his fascination with inverted reflections in these liquid mirrors. In 1893, he acquires a piece of land situated at the end of the Clos Normand, on the other side of the railway line, and diverts the narrow arm of the river Epte , the « Ru ». The thus- created pond will become the « Jardin d’eau » (water garden) , today present on the walls of the world’s greatest museums. 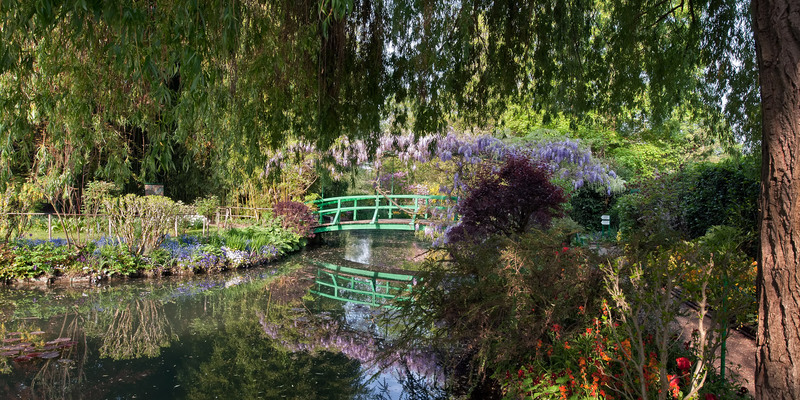 Monet was so proud of his water garden that he liked to receive his guests there , and spent hours contemplating it. A full time gardener , in charge of its maintenance, removed each dead leaf to ensure the perfect beauty of the pond. In 1897, he starts to paint the « Nymphéas » . In seeking to capture the atmosphere of this surface of sky , on which touches of colour float, Monet is to achieve one of his greatest masterpieces and push his painting to the limits of Abstract Art , in which the vibration of colour is sufficient to evoke a world of feelings and emotions.